Stanley Kubrick and “One-Point Perspective”: Watch a thrilling supercut of Stanley Kubrick’s favorite symmetrical composition. An example of one-point perspective from The Shining. Still from “Kubrick // One-Point Perspective” from Vimeo. For his latest supercut, new this morning, kogonada highlights Kubrick’s use of “one-point perspective,” which refers to compositions in which spatial planes converge at one vanishing point in the distance—such as in a shot down a long hallway, or over train tracks headed into the horizon. 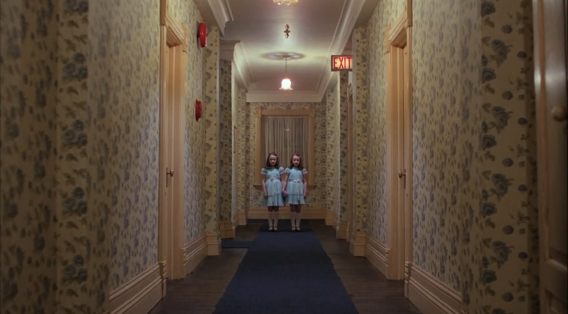 As the video highlights, Kubrick also tended to place his subjects right over that vanishing point, dead-center in the frame, making any symmetry (especially in creepy twins) particularly striking. That might all sound a bit wonkish, but combined with kinetic editing and the Requiem for a Dream soundtrack’s propulsive and ultra-dramatic “Lux Aeterna,” it’s thrilling.